ARTILIUM - The leading developer of Microsoft-based carrier-grade software for mobile networks. Savi Technology, Inc. - A technology and information services company that provides real-time supply chain management and security solutions for commercial, defense and public sector markets worldwide. Our documentation team has been using DITA-FMx since January 2008, and we've found that it brings the same kind of author-centric tools and shortcuts to DITA editing that has made FrameMaker such a popular tool for technical writers. No other DITA editor can match FrameMaker with the DITA-FMx plug-in, in our experience: from automatic file naming to advanced conditional text (ditaval) features, DITA-FMx has it all and it keeps getting better with every release. DITA-FMx is an incredibly cost-effective tool for those writers who want to get advantages of using DITA while staying with FrameMaker. DITA-FMx provides powerful support for the DITA authoring and publishing process, including handling content filtering, search, and "where used" functionality. If you are moving to DITA and using FrameMaker, you should definitely consider DITA-FMx. We are offering DITA-FMx to our clients that use this plugin to produce content with many content variations, customize documentation to different OEM partners, and generate FrameMaker books. What is not less important than powerful features is that DITA-FMx comes with amazing support. Whatever it is - a newbie's question or complicated request - the Leximation team responds instantly and always gives very helpful advice. We are offering DITA-FMx to our clients that use this plugin to produce content with many content variations and outputs. DITA-FMx turns out to be very helpfull for technical authors or documentation specialists that start working with DITA and FrameMaker. DITA-FMx integrates perfectly in the FrameMaker environment and adds the functionality that one needs to work effectively with DITA. Relativity Technologies - Aligns business and IT through Application Modernization. Whitestein Technologies - A pioneer and leading innovator in the area of software agent technologies, autonomic computing, and autonomic communications. FABMation GmbH - Specializing in software development, project management and consulting for automation, communication and robotics in the semiconductor, display, and photovoltaic industries. I mainly use DITA-FMx for producing custom training workbooks for FrameMaker and DITA classes. I appreciate the ability to create templates, the Ditaval Manager, setting attributes via a checkbox (especially the fmdpi value! ), searching within files, and easily accessing the DITA Reference. I also like the ability to specify a naming convention for new files, including putting them in a folder based on topic type if I choose. More than anything, I appreciate the technical support and troubleshooting help. DITA-FMx gives the author a complete DITA authoring and publishing environment. DITA-FMx offers good support of advanced DITA features, such as conrefs and ditaval. DITA-FMx comes with excellent support and Help. DITA-FMx has content management features such as "Where Used" and "Search in Files". Expert Support Inc. - Technical documentation, training, management, and engineering services. I use DITA-FMx with FrameMaker v7.2 to convert a specific set of DITA content to a range of FrameMaker books, where each book displays its own unique formatting and structure. 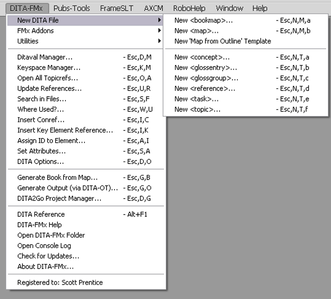 DITA-FMx has the power to convert dita and/or xml files containing individual topics from within a ditamap to fully-functional FrameMaker books via different applications, where each application produces output each containing its own formatting and structural information. Note: This is an opt-in list. If you'd like to be added, please contact us! DITA-FMx is a set of plugins and structure applications that provide enhanced authoring and publishing of DITA XML files in FrameMaker. DITA-FMx is a complete DITA authoring and publishing solution. DITA-FMx 2.0 supports the DITA 1.2 specification and FrameMaker versions 7.2, 8, 9, 10, 11, 12, 2015, and 2017. DITA-FMx 2.0 provides all of the functionality from DITA-FMx 1.1 plus support for DITA 1.2 along with a number of other enhancements and updates. To compare the features provided by DITA-FMx with those provided by various versions of FrameMaker, see FrameMaker DITA Feature Comparison. Because DITA-FMx produces 100% compliant DITA files, it can be used side-by-side with other DITA XML editors. So, what's the plan for DITA 1.3? Check here for DITA 1.3 Support in DITA-FMx. A fully functional 30-day trial is available, so feel free to download and give it a test drive. DITA-FMx is priced at USD$235 for a single user license with a 10% discount for 5 or more licenses. A 25-user "site" license is available for $3525 (the cost of 15 individual licenses). A licensed user is allowed to install DITA-FMx on all supported versions of FrameMaker and on multiple systems provided that the installations are not used simultaneously by different people. Download. DITA-FMx 1.0 supports DITA 1.0 and FrameMaker versions 7.2 and 8. This version remains available for those who aren't ready to upgrade. We do suggest that you try the 1.1 version since it should allow you to continue working with your customized 1.0 structure applications, while providing added functionality. Download. DITA-FMx 0.0 supports DITA 1.0 and FrameMaker versions 7.1 and 7.2. DITA-FMx 0.0 is free, and will continue to be available for those who need to work with DITA in FrameMaker 7.1 or those who are happy with the limited features that it provides. No further development or enhancements will be made to this version. Note that the FM7.1 version does not support the DITA map to FM book conversion. Download. Support for DITA 1.2 features (while still supporting earlier models). Supports key-based referencing of files (via keyrefs and conkeyrefs) and content (as "key element references"). Key space management optionally filtered by ditaval. Automatic resolution and generation of key spaces. Key-based glossary term referencing including optional use of <glossSurfaceForm> and <glossAlt> content. Include content from non-DITA sources with the new coderef element. More robust support for FrameMaker variables. Control when <navtitle> elements are added to maps (useful for environments migrating from DITA 1.1). Automatically generate a map and stub topic files from a simple tabbed list or text file. New file names automatically generated based on proposed title and building-block data (unique ID, topic type, date, time, etc.). "Save View Settings" command (no need to modify the templates to set custom view options). Select custom element template when creating a new file so you start off with the whole topic structure in place. Automatically add and update prolog data on file creation and file save. Allow the use of FM variables in DITA files and generated FM files. Reference Report command generates a report listing all references in the current map or topic. Generate a ZIP archive from all files referenced by the current map or topic. Supports the use of graphic overlay objects (callouts) for FM-rendered output. Ditaval Manager allows you to create and manage ditaval files from within FrameMaker. Supports filtering in generated FM files by applying conditions based on a ditaval file. Search for content in files on disk based on text, element, or attribute values. Where Used command generates a report listing all places a topic or element is referenced as a conref. Context sensitive help (Alt+F1) on DITA elements, can be customized to add your specialized elements. Generate a PDF-ready FrameMaker book from a DITA map or bookmap; automatically apply pagination, numbering, custom templates, etc. Generate output from the current map or topic through the DITA Open Toolkit. Also, complete CMS integration with .. Bluestream XDocs 4.x, using the XDocsFMx connector. Create and edit 100% valid DITA 2.0 (or earlier) topic and map files. Exchange DITA files with those created in other XML editors. Provides well developed structure applications for topic and map editing that can be customized to suit your needs. Properly handles EDD/structapp with specialized elements (meaning that assuming you've properly set up the DTD and EDD, it will work with your specialized data model). New file names automatically generated based on proposed title and other criteria (unique ID, topic type, date, time, etc.). Reference Report command generates a report of all resolved or unresolved references in the current map or file as well as any references in referenced files. Create Archive command generates a ZIP archive of the current file and all referenced files. Flatten Conrefs command unlocks conrefs in FM files. Where Used command generates a report listing all places a topic or element is referenced. Automatically generate a map and stub topic files from a simple tabbed list. Add and update prolog data on file creation and file save. Enhanced whitespace normalization eliminates the problem of opening files created in other editors. Context sensitive help (Alt+F1) on DITA elements; can be customized to add your specialized elements. Insert conrefs to all elements through an easy-to-use interface. Automatically resolve references (conrefs, xrefs, and links) on file open. Conditionalize prolog, comments, and data elements on file open (hide or just apply coloring). Automatically add IDs to elements if required. Supports FrameMaker-style xrefs ("Heading on page NN") as well as DITA-style xrefs and links. Supports ditaval filtering using conditions. Auto smart-spaces and auto smart-quotes makes it easier to work with code in documents. Manual line breaks are preserved in PDF output. Document dictionary entries are stored in the DITA files. Automatically set the status attribute for new and changed content. Multiple marker types round-trip to DITA as data elements. Supports optional columns in properties tables. Faster resolving of xrefs and conrefs on file open. Allows browsing for files "on disk" .. no need to open the file before placing an xref or conref. Displays only the element tags for available elements that exist in the target file. Easy editing of DITA maps with a drag and drop interface. Manage relationship tables in an easy to use table structure. Open all topicrefs in a map with a single command. Newly created topics automatically added to map. Control the appearance of topicref elements in the map (title, filename, or both). Auto-open maps in document view (FM9/10 only). Full support for bookmap elements. Default Topic application is less "book-like." Because DITA-sourced content may be used for many types of output, we have removed many of the print-specific layout and formatting features from the default Topic application. This helps authors to focus on the content rather than the formatting, and results in topics that are more useful in all deliverable formats. The Book application has been updated so the book title (as defined in the map) is passed on to the generated FM files as a footer variable. Supports the use of topic-specific DTDs. Seamlessly round-trip DITA's nested indexterm elements with FrameMaker markers. The index-see, index-see-also, and index-sort-as elements properly convert to FM marker syntax on import and export back to DITA elements on file save. An Options dialog allows for extensive control over the formatting and syntax of the imported markers. The indexterm elements now import as fm-indexterm elements. If you have complex indexterm elements that contain child elements other than indexterm, index-see, index-see-also, and index-sort-as, you can disable the indexterm to fm-indexterm conversion (in Options) in order to preserve the native DITA structure. Provides control over the formatting of index entries in PDF output. Dynamic updating of image placement based on attribute values or FrameMaker properties. Warning on save when anchored frame contains invalid objects (to prevent data loss). Provides visual placement of referenced graphics. Add callouts and other graphic overlay objects to images in FrameMaker and have them round-trip to DITA and back. Login/logout, create new files in the repository, as well as check out and check in files. Publish files through FrameMaker or use the XDocs Explorer to publish through the CMS. Properly resolves references to read-only files. Properly handles "slash-rooted" file references commonly used by server based systems. File references can use Windows UNC paths. The Generate Book from Map command handles conversion of a bookmap into an FM book in a similar way to the conversion of a map. All "top-level" topic references are converted into an FM file, and any child topicrefs are appended to that file. Any topic references within a frontmatter or backmatter wrapper element are considered "top-level" topic references and become FM files. Additionally, if your bookmap uses a part element to organize chapters, the file referenced by the part will become a separate FM file, and each chapter will be considered a top-level topic reference and will be added to the book after the generated part file. Additional book-build feature lets you include unstructured FM binary files in a generated book (great for adding a title page, but can be used for other content as well). The book title (from the map) is now imported into the generated list files as a variable (for use in headers/footers or elsewhere). Import map metadata as variables or conditional text settings in generated FM book. Pre and post book-build scripts ensure that all files are set up properly for each book build. Supports language-specific book-build INI files. Book-build INI settings can override the defaults to ensure a consistent book build. Use the topicref/@outputclass variable to specify the template applied to each book component. Numerous publishing options are now available that specify processes to be run on the generated book and components. Add related-links from reltables as link or fm-link elements. Flatten conrefs (for proper link functionality in PDFs). Convert xrefs and links into live Hyperlinks. Move indexterms in the prolog into the topic title so they are not filtered out if the prolog is hidden. Apply ditaval as conditions to perform ditaval-based filtering. Move figure title elements to the end of a figure element. Convert table title elements into "real" FM table titles so they appear on multiple pages, also supports the Table Continuation variable. Assign numbering and pagination to the book component files based on their map element type. In a bookmap, replace the "list" files with generated FM lists. Apply templates to the book component files based on their map element type. Run a custom FDK client or FrameScript. Now run multiple clients. Hide "conditionalized" content (such as prolog, comments, and data elements). Update the generated book and files. Easily connect to any version of the DITA Open Toolkit. Publish a DITA map or bookmap through the DITA Open Toolkit to generate any standard or user-defined output target. Select a ditaval file in FM for conditional filtering. Leximation provides free email support for installation and usage issues. We are also happy to offer a phone and/or web conference to discuss the benefits of DITA-FMx and show you how it can integrate with your authoring/publishing workflow. Feel free to contact us if you're interested. For notification of updates and to discuss issues with other DITA-FMx users, subscribe to the dita-fmx-users Yahoo group. InfoParse, Inc. - InfoParse, aka Mr. DITA Japan, offers a variety of DITA-related tools and workshops. Provides training modules to train your team on the topics with your choice of FrameMaker-compatible CCMSs (DITAToo, XDocs, Vasont, and AEM) in DITA environments. Publishing Smarter - One of the original template developers of Adobe FrameMaker's DITA functions, we continue to develop applications (EDD, templates, etc) for our clients. We provide file conversion, content analysis, and provide online or classroom based DITA-FMx training. Flow Technical Communication, bvba - Flow is a communication consultancy firm, specializing in: Technical writing and user documentation design, Information modeling with DITA, and FrameMaker / DITA training. Flow offers client-site and web-based DITA-FMx training. Suite Solutions - Suite Solutions offers a variety of DITA-related courses and workshops. We can mix and match training modules to train your team on the topics you need, when you need them. Scriptorium Publishing Services, Inc. - For companies that have large amounts of technical content, our consultants provide expert advice and collaborative development. Streamlining the publishing process results in cost reduction and quality improvements. Download DITA-FMx v.2.0 [26200 KB] - Try before you buy!